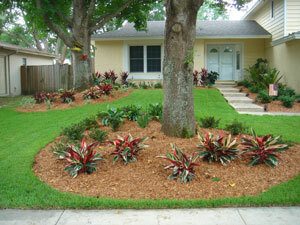 Evergreen Total Landscape has been a trusted landscaper in the Tampa Bay area and throughout Florida since 1983. As a pro-active landscaper, we believe that what sets us apart from the competition is the customer experience we provide. We routinely inspect our job sites to ensure any problem that arises is fixed quickly and without customer worry. And we warranty every job we complete, so in the rare instance that a problem does occur, customers can rest assured knowing that we’ll be there quickly to address the situation. If you want a landscaper that takes pride in building personal relationships with customers, look no further than Evergreen Total Landscape. Our customers love us as their landscaper because we don’t rest until they are completely satisfied, and they can easily speak with an active on-site project manager or the owner of the company to voice any questions or concerns. Call or e-mail us today for more information on our reliable landscaping services. We want to be your landscaper no matter where you’re located in Tampa, New Port Richey, Lakeland, St Petersburg, or another surrounding city.